1. Place the cake on the cake plate. Reserve 1 cup of frosting to make additional ghost figures. Using an offset spatula, fill the hole in the center of the cake with frosting and then spread frosting over the top and sides in a wavy pattern. 2. Add the reserved frosting to the decorating bag; snip off the tip of the bag to create a 1/8- to 1/4-inch opening. 3. Referring to the photo, pipe as many ghosts as you like onto and around the cake and into the eggcups. For each, apply pressure to squeeze out some frosting for a base, then lift the bag slowly, decreasing the pressure until the ghost is the desired size; stop the pressure and lift off the bag. Add 2 candy eyes to each ghost. Place the cake on the cake plate. Reserve 1 cup of frosting to make additional ghost figures. Using an offset spatula, fill the hole in the center of the cake with frosting and then spread frosting over the top and sides in a wavy pattern. Add the reserved frosting to the decorating bag; snip off the tip of the bag to create a 1/8- to 1/4-inch opening. Referring to the photo, pipe as many ghosts as you like onto and around the cake and into the eggcups. For each, apply pressure to squeeze out some frosting for a base, then lift the bag slowly, decreasing the pressure until the ghost is the desired size; stop the pressure and lift off the bag. Add 2 candy eyes to each ghost. 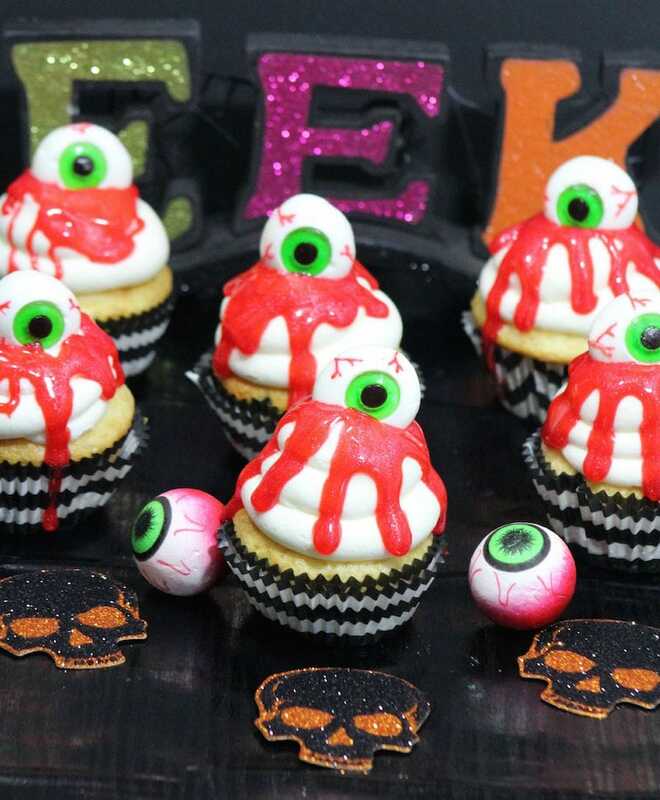 Check out a few more Halloween recipes!